Just a note to let everyone know that I update the blog photo's often so if you haven't looked lately you might want to check them out. Michelle on her first sheep hunt. 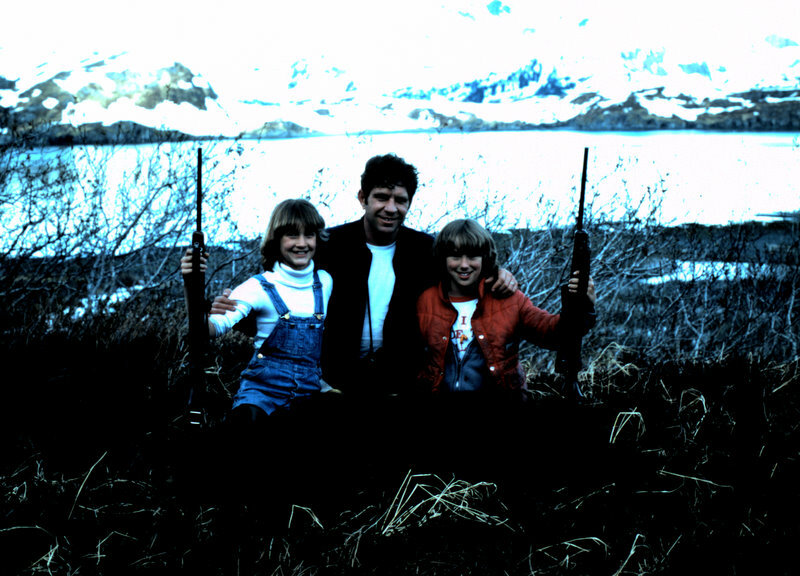 Michelle, age 10, with her black bear. Both of my daughters played sports so I wanted to open the world of hunting to them. I took both of them hunting at the young age of ten or eleven. Kim decided while on a black bear hunt that, it wasn’t for her. Michelle, on the other hand, on her first trip shot a black bear and thought hunting was pretty cool. We went with her friend Lisa and Lisa’s dad, Chuck Wirschem on his boat in the Prince William Sound area. We left for the hunt right after their track meet at the end of the fifth grade. It was a wonderful experience and a great way for her to be introduced to hunting. Michelle with her black bear, me and her friend Lisa Wirschem. As an avid sheep hunter I thought it would be really fun to take Michelle on a sheep hunt. While talking it over with her I could see her enthusiasm growing, so we made plans to go in late August, 1981 right before she began the seventh grade. She had taken her black bear with a Model 77 Ruger .243 Winchester. Right from the start she was truly a great shot. I would say she was a natural. Again she would use the .243. I started out sheep hunting in the Kenai Mountains in ’66 and continued to hunt different areas on the Kenai over the years. I’ve also hunted many really rugged areas in the State. I wanted Michelle to enjoy sheep hunting as much as possible so I wanted to start her out in one of the easier areas so I chose the Kenai Mountains. I knew of many good places she could handle. One was the Crescent Lake area. I had hunted that area with my friend Mike Herbert the year before seeing rams but not taking one. Mike ended up going back a few weeks later with our friend Dan Schwarzer and took his first ram, a nice 35” full curl, so this seemed like a good place to start. Karen was thinking for safety reasons it would be better if there were two adults so Dan volunteered to go with us to help out and give me a hand. That August my friends and I did a fly-in sheep hunt in the Wrangell Mountains and Dan harvested his first ram a 36 incher. That hunt got me fired up for my up-coming hunt with Michelle. I decided we would go on Labor Day weekend. My next door neighbor, Dave Brotherton, was a member of a flying club which had an Aeronca Champ on floats. He volunteered to drop us off in Crescent Lake which would save us a six-mile walk. All of our past hunts in that area were walk-ins. Everything was falling into place so all we needed now was good weather for that weekend. It was a beautiful Friday morning in August for Michelle and me to be driving down the Seward Highway to the Quartz Creek campground on Kenai Lake to meet Dave for the flight in. Dan flew down with Dave and they arrived right after we did. Dave flew Dan in with all the gear and then came back to pick up Michelle and me. After saying good-by to Dave we started our climb up the mountain. As far as climbs go it was relatively easy and Michelle had no problem. Dan and I laughed at how well she was doing especially being so young. That was the first time I had taken someone that young on a mountain hunt. We took our time and made it to a perfect camping spot in about four hours. It was flat and next to a small lake formed from snow. There was a small stream from the snow running into the lake that we used for water. It was also above the rougher areas on the mountain where the sheep were mainly located. It was just perfect. Michelle at camp with Dan in the background. We set-up a nice camp using a tarp and my small tent. Michelle and I shared my Eureka pop-up and Dan slept in the tarp tent. I used a grasshopper stove for my backpack hunts back in those days. It had two legs and a burner and it required a screwed in propane bottle for the third leg. It was a great little stove but the negative was the propane bottle was a little heavy. I still have that stove and use it sometimes as a spare on other hunts. That evening we had a freeze dried meal for supper. Back in the day, we started out using the Tea Kettle freeze dried dinners which were really small. Then Mountain House came on line with a larger portion meal but advertised it as a two-person meal. I however felt that it was a good one-person meal. Michelle had never eaten a freeze dried dinner before and I was thinking because she was little that I would more than likely end up eating part of hers. She really surprised me by eating the whole meal and wanted to know what else we were having. Again, Dan and I cracked up at how fast she was adapting. The next morning we split up with Dan hanging around camp and checking the south side of the mountain and Michelle and I went west. The mountain was fairly round on top with a ridge and no peak. There were rock outcrops that shot out from the mountain where the sheep hung out when they were looking for protection. As Michelle and I moved down overlooking a large rock face I spotted a small band of six rams lying in the snow trying to stay cool on a sunny Alaska day. As I looked them over in the spotting scope I could see there were at least two that were ¾ curls which in those days were considered legal. They were at least 400 yards away and I wanted to make sure they didn’t see us. It looked like we could get closer and stay out of sight if we moved down the ridge above the cliff. We were taking our time slowly crawling down the ridge when I heard some rocks falling below us so I thought they could be coming up the cliffs. I whispered to Michelle to keep close and watch for them to pop up on the ridge. I felt that they would try to come up above us and was looking up when suddenly Michelle grabbed my arm saying, “Dad, dad there they are.” As I turned to look down and to my right two rams were staring at us less than 40 yards away. One of them was legal. Trying to control myself I grabbed her and told her to lie down and get ready to shoot. The rams spotted our movement and took off up the mountain at a full run. I had thrown my pack on the ground next to her and was frantically trying to position her body in place for a shot. As they kept moving farther away up the mountain I knew it was hopeless unless they stopped soon. At about 250 yards they stopped and stood broadsided for a few seconds. Not being a seasoned hunter there was no way that Michelle was going to make that shot. Even though I knew that, it was still hard as I watched them turn and continue their escape. What an exciting but disappointing moment for both of us. It is still etched in my mind to this day. After we got ourselves composed we moved up the hill to see if we could catch another view of them. We never saw another sheep on that hunt. Once we got back to camp that afternoon it was still warm and Michelle asked if she could use the G.I. air mattress that she was sleeping on to float in the lake. I said, “Of course, but I’m not about to get in that cold water.” It was just a couple of feet deep. I took pictures of her floating in that small little snow lake. What a great experience and a wonderful day. The next day the clouds came in below us so we couldn’t check most of the cliff areas but were able to see the areas above us. We didn’t see anything so we broke camp late that afternoon and dropped off the mountain in less than two hours. That was less than half the time we spent coming up which is normal of course. As we were going down I talked to Michelle about her not getting a ram on her first sheep hunt. That it was the norm and if she had taken a ram on her first sheep hunt like she did her black bear, she would have thought it was too easy. She knew that many of my hunting buddies had never taken a ram and some had been on multiple hunts. But in my mind I knew it almost happened and to come so close on her first hunt was unbelievable. Michelle and Dan as we were hiking off the mountain. Crescent Lake below. We spent the night next to Crescent Lake and Dave picked us up mid-day the next day. What great memories of a special hunt with my daughter. Little did I know that twenty-six years later Rachel, Michelle’s ten year old daughter, would take a great ram on her first sheep hunt. God is good! Michelle's ten year old daughter Rachel with her beautiful 38" ram.